Tamms Community High School "Eagles"
Tamms (population 1,043) is located on far southern Illinois in the east-central portion of Alexander County. Illinois Route 127 is the main roadway that leads you to and from Tamms. A county road titled "Tamms Rd." will also lead you into town. The Illinois Central Gulf Railroad passes through town as does another unidentified railroad line. The Amber Creek flows to the east of Tamms. Tamms was first named Idlewild in 1893. The name was changed to Tamms in 1900. The town is named after Theodore and Oscar Tamms, who originally owned the land the town was platted on. Tamms Community High School likely was established in the early 1900s. 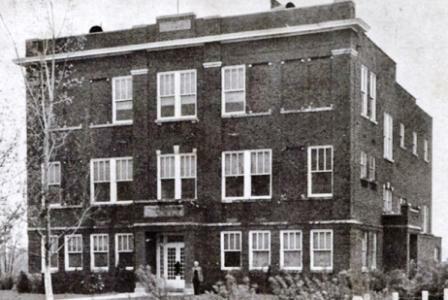 In 1924, the community voted to build the Tamms Community School building. Olive Branch High School closed in 1947 and some of the children in that district began attending Tamms High School. Tamms Community High School was integrated in 1952 allowing African-American children to attend. Prior to this year the African-American children near Tamms had to attend African-American high schools in Cairo (Sumner) or Mound City (Lovejoy). In 1953, the Tamms High School building caught fire. The third floor and rear portion of the building were destroyed. The first and second floors, as well as the front of the building were saved. The high school building was shortly after rebuilt in 1954. Once the building was reopened, the name of the school was changed to Alexander County Central High School. The school served the people of Tamms and the surrounding area until 1963 when the name was changed to Egyptian School District. This area also reflects interest in Egyptian history, as Cairo is the capital of Egypt. The new consolidated school in Tamms is possibly as a reflection on the area's roots. Several items for this page were located at the web address of http://genealogytrails.com/ill/alexander/alex_sch.htm . We also owe a large amount of gratitude to Tamms Alexander County Central High School graduate Phineas Moore (Class of 1957). Phineas provided most of the research for the history portion of this page. Tamms HIgh School nickname: the "Eagles"
Tamms Community High School offered the boys sports of basketball, baseball, and probably track. The school had many excellent athletes and seasons. However at this point, we are searching for these results. Please contact us at ihsgdwebsite@comcast.net if you would have information to share regarding Tamms Community High School athletics. Though we do not currently have any informaton regarding season records, coaches' names, and individual athletes, we have located some basketball scores involving Tamms Community High School. These scores were found on a website titled "Illinois Postseason Basketball Scores" and are reprinted below. **Tamms Community High School became known as Alexander County Central High School in 1954. Other activities such as proms, dances, class plays, farmer's institutes, and various clubs may have been a part of the Tamms Community High School experience as well. We are hopeful an area fan or alumni can help us with this information.